Wearable GIS technology gives frontline workers a new perspective on facilities maintenance. Equipping wearers with a second set of eyes, VisualSpection's augmented reality smart glasses include a touchpad, camera, and visual overlay (which displays images on top of video). Wearing the glasses, fieldworkers drill, dig, scale towers, and go down sewers while accessing and collecting data. 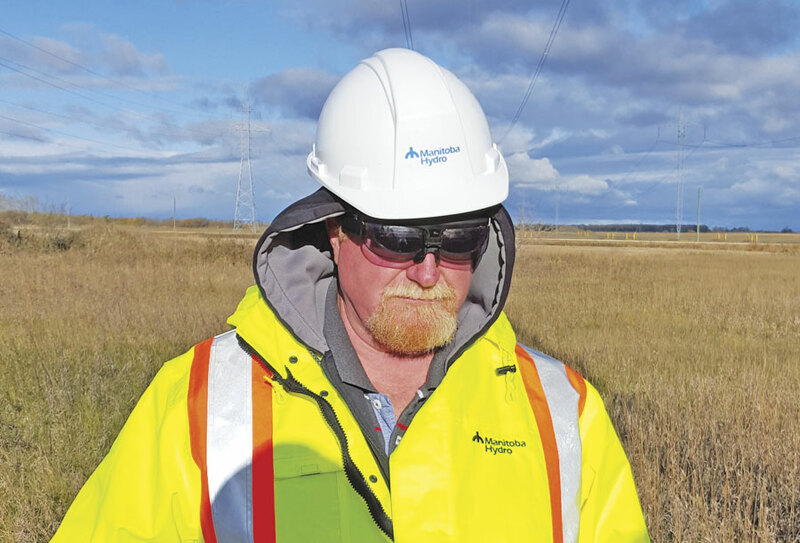 At the same time, asset managers get a first-person perspective on facilities through the eyes of field crews. A utility worker wearing the glasses could walk up to a power pole and see its transformer information in the visor. The glasses record the worker's comments, take photos, and capture location information. They are voice driven, so the worker can safely maintain three points of contact with the pole. The globes are popular with museum visitor centers. Visitors interact with the spherical data to understand the surface of Mars or Earth's tectonic plates. Users access global data from NASA, for example, to understand ecology and climate change stories in a visually appealing way. The sphere also projects videos. 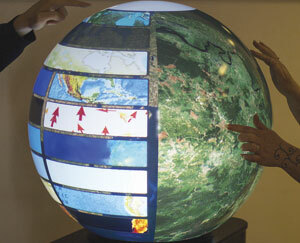 Working with Esri, the startup's designers have equipped the sphere technology with ArcGIS workflows. Users publish their maps to the globe and seamlessly interact with data layers and features. They can drill into information, add map layers to a basemap, and interrogate data. 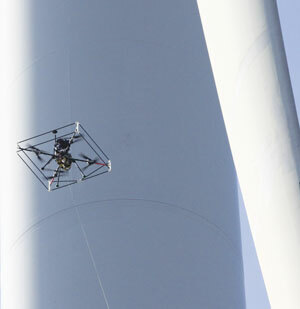 To mitigate wear on wind turbine blades, InspecTools uses image sensors and custom-made drones that can withstand high winds to take very-high-resolution images of the blades. The data goes into a geodatabase along with the turbine's factory blade information, status, and maintenance history. 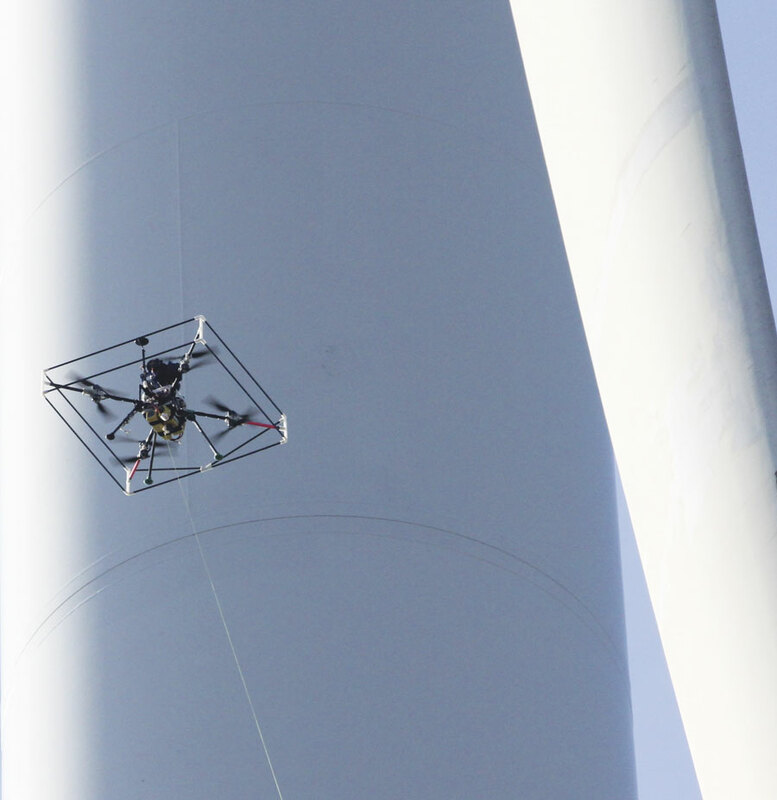 Users can open a schematic of the wind farm, click a tower, check blade wear, and draw a polygon around the problem right on the photo.